I originally thought my wife would want the frame painted, but now she is thinking stained. I hear all kinds of cautionary tails about staining poplar. What are the preferred recipes out there? Shellac and stain, wood conditioner and stain or oil, gel stains only?? I have never ventured into the world of shellac before. I am generally a Watco oil kindda guy. 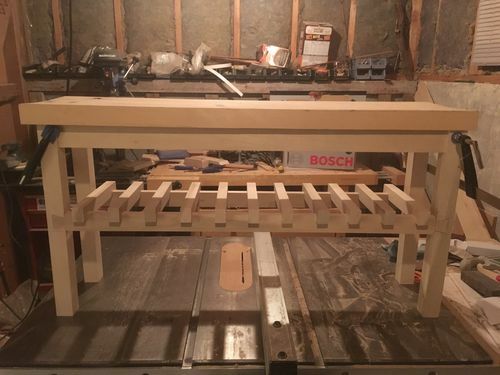 Looking at the design I think shelacing it now going to be very hard I would of done all the cross members on the bottom rack prior to attaching them, never had a problem with Poplar, sometimes Maple and Birch have not turned out as expected? Poplar does look nice with a few coats of Shellac or French Polish. Those bottom pieces are not yet solidly affixed for specifically the reason you cited Andre. I plan to finish before final assembly. Right now only the basic frame is glued. You have probably heard that some woods blotch when colored with dye or stain, like cherry and maple. 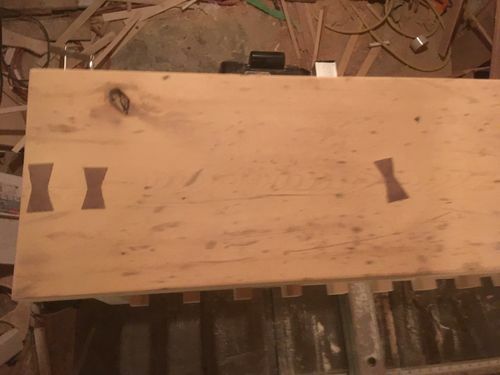 Well, with poplar the whole surface blotches, meaning it is a “ thirsty” wood grain. That cedar on top will probably blotch. Yes use a conditioner, even with danish oil. Otherwise the whole thing will look like it was infused with color and the grain wont hardly show. Since you like danish oil, Here’s a link for blotch control and various finishing oils. Smart move, I avoid sandpaper with Poplar (almost all woods) Plane or scrapper finish with A good French polish would look amazing! IMHO. Poplar usually looks like crap, paint it and that will further accentuate the nicer yellow cedar piece. Your poplar looks nicer than most, but its low light so hard to tell. You could leave the yellow cedar unfinished. I would paint the poplar and leave the cedar clear. Just tell her that poplar won’t take a stain well, it’s not a lie. I had good luck with Transtint dye followed by a gel stain and shellac. MOSU55 is right: poplar colors just fine If done correctly. And I agree with Mr Pink. Transtint dyes are perfect for popular. Followed by gel stain. Then a clear topcoat (I use General Finish satin poly). They don’t blotch and look great. Stains that contain pigments are much more likely to blotch than a pure dye. So a dye is a good first coat. And the gel stain is thick and not deeply absorbed so also reduces blotching. I’ll post a couple of pictures tomorrow after the sun comes out. Looking at the design I think shelacing it now going to be very hard. And why would it be the case ? Shellac sprays very good even from the cheapest sprayer. Wood conditioner, 3 layers stain, 2 layers polycrylic. I meant if he was going to hand wipe, as to the process of French Polish? Never seen a Shelac spray? Shellac….1st coat untinted…2’d coat tinted shellac with dye….keep repeating coats/ adjusting color until your happy with the tone and # of coats… very light nub removal..final two coat with a poly…Best way I know to beat the blotch monster.. Some would advise to embrace it’s natural tone….There are different ways but that is the safest way if the bride insists…. I’ve done that many times before and never had a pull your hair out moment….